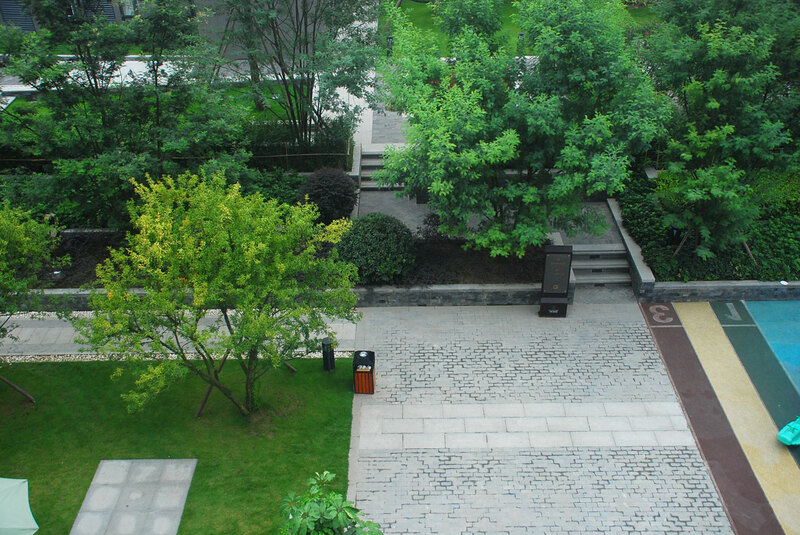 Metrostudio originated from Salerno, Italy in 2000 and entered the China Market in 2005. 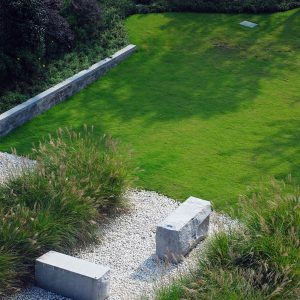 We provide an integrated design service of planning, architecture, landscape and interior. 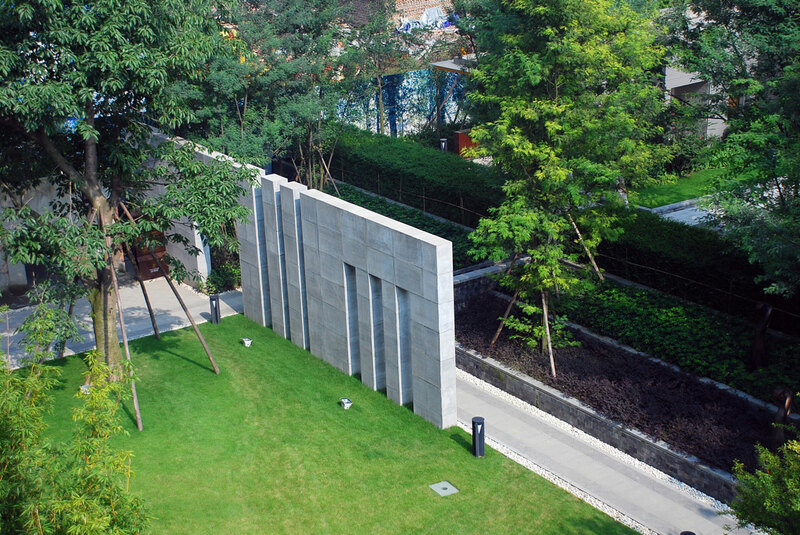 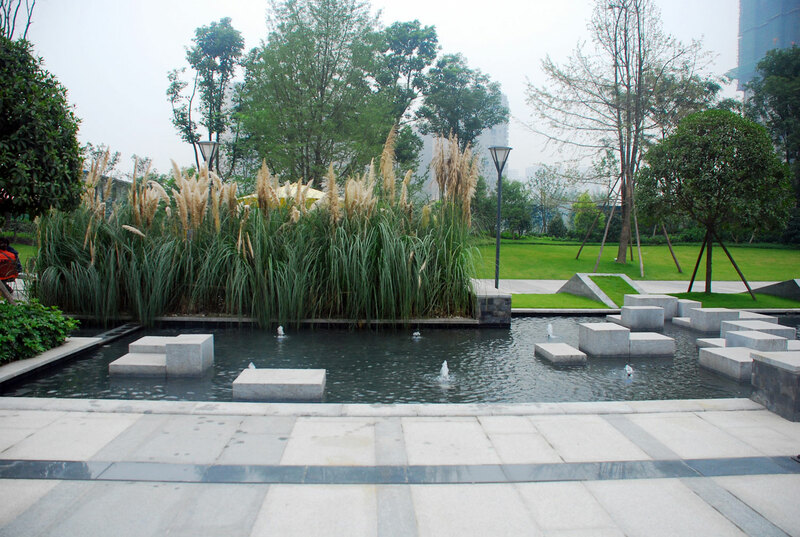 In 2009, Shenzhen Metrostudio Landscape Design and Urban Planning Co., Ltd and Shenzhen Metrostudio Architecture Design Co., Ltd were successively established. 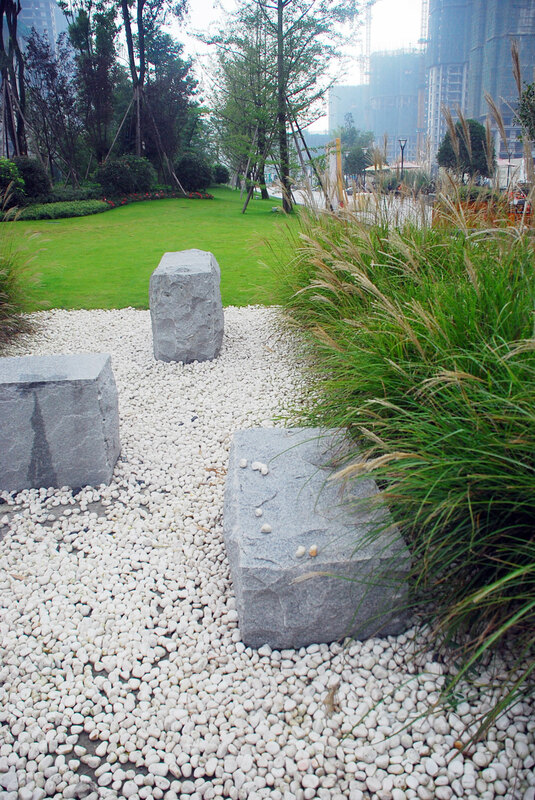 We steadfastly promote the modern European design concept based on “every line has a meaning”. 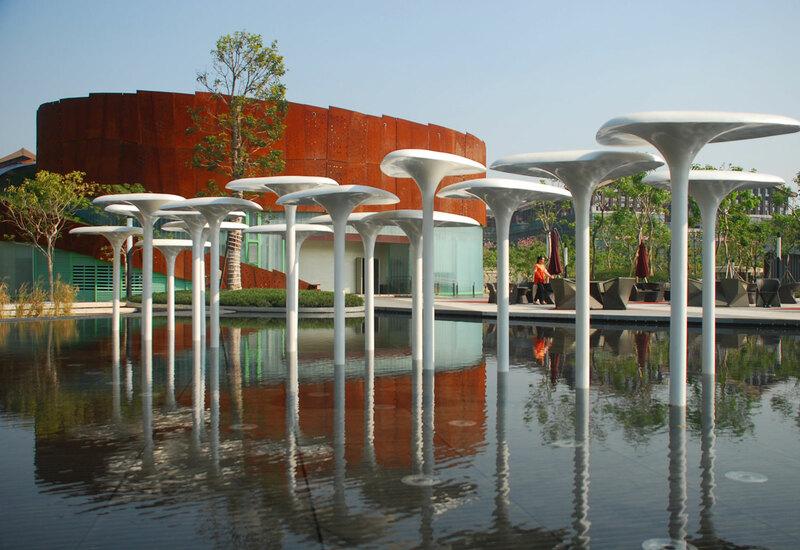 The vision of Metrostudio is to become a world-known and well-respected design company. 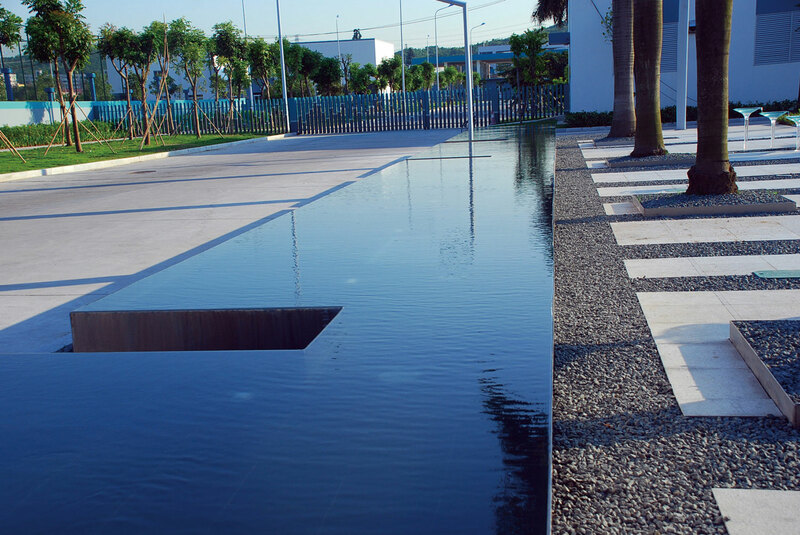 After over ten years’ remarkable development, Metrostudio currently has more than 100 employees, consisting of planners, architects, landscape designers and other technical professionals coming from different countries such as Europe, South-East Asia, China, etc. 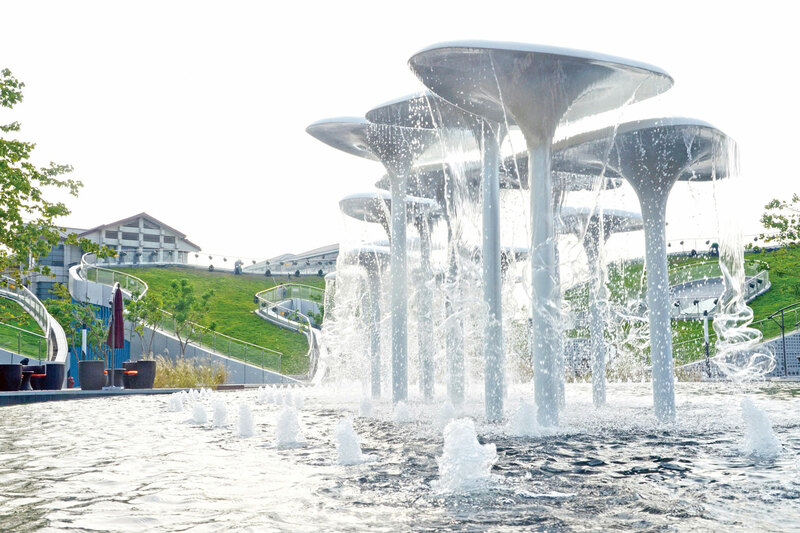 The strong design strength and rich operating experience in international projects have contributed a great deal to Metrostudio’s worldwide business and also the numerous awards won at home and abroad. 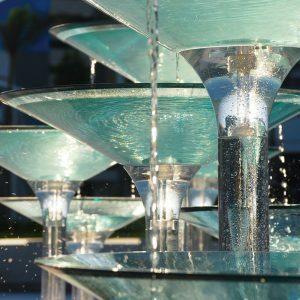 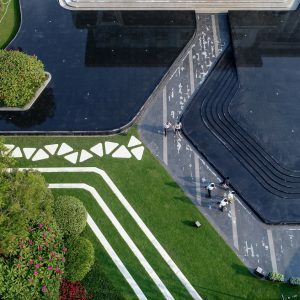 Metrostudio pursues unique and creative design in urban complex, tourist resorts, residences and municipal parks, etc., insists on innovation by energetically exploring new materials and technological applications, and attaches great importance to details and provision of high-end custom design. 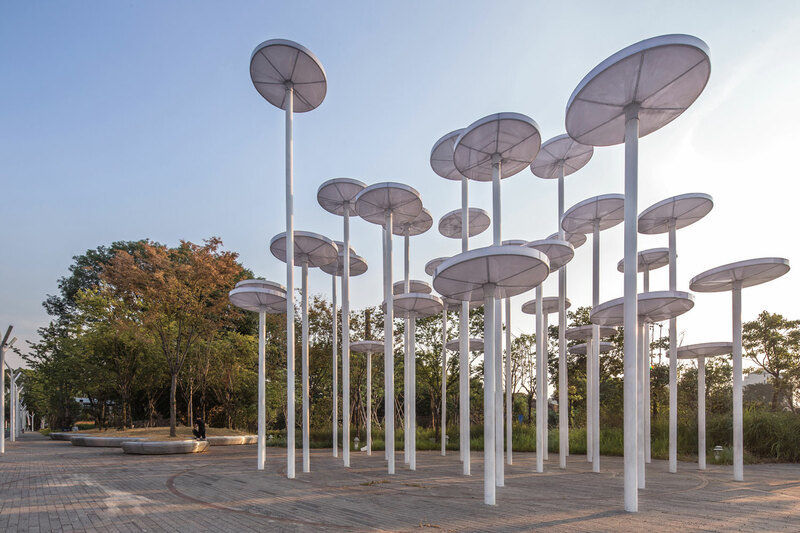 By virtue of a keen understanding of nature, culture and design and a highlight on people’s environmental and spatial experience, Metrostudio has been highly recognized by customers with aesthetic and eco-sustainable design. 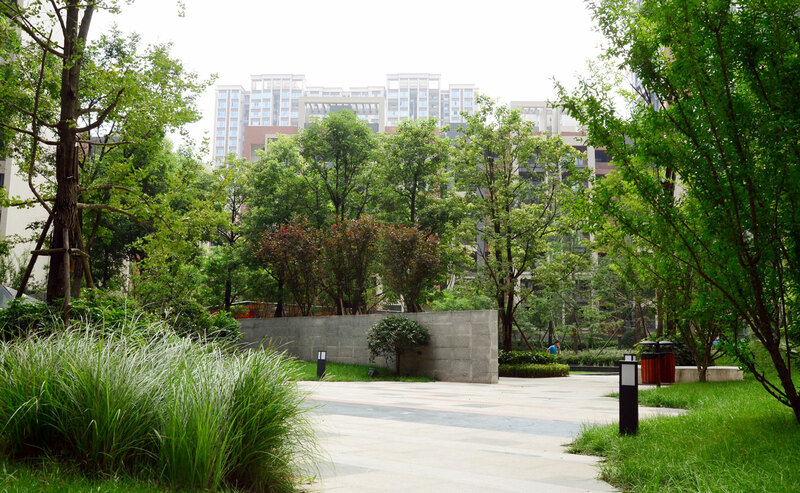 While we create value for clients, we build a better environment. 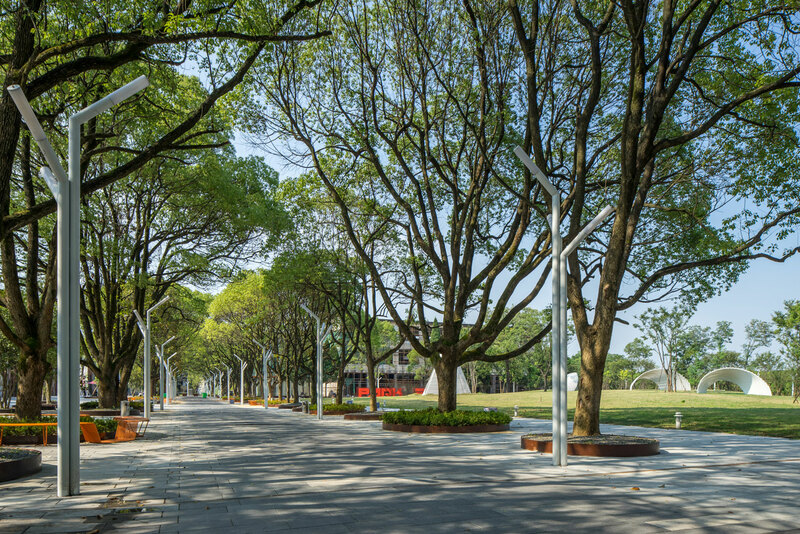 Park 258, formerly as light industrial textile plant in the 1980s, is located in the center of geographic and economic of western Quzhou. 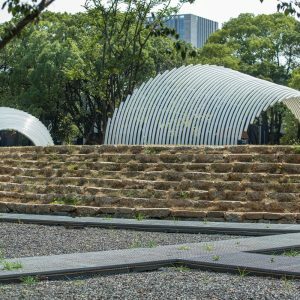 The design aimed to preserve and reform the old factory and build an innovative, sustainable employment base, build garden-like work and life style. 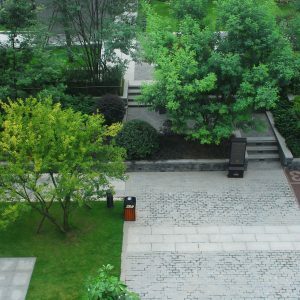 The original architectural style is Bauhaus; the overall structure is still in its integrity and its facade lines, and proportions are still harmonious and unified with its unique aesthetic feelings. 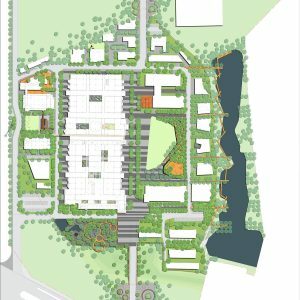 With the design idea of replacement and filling, we moderately open some of the huge closed factories and add new buildings as public art spaces, step by step adding and reforming from the inside to out. 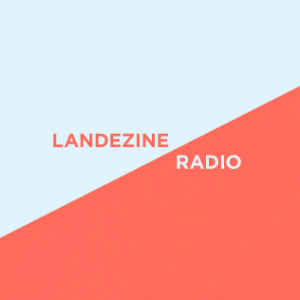 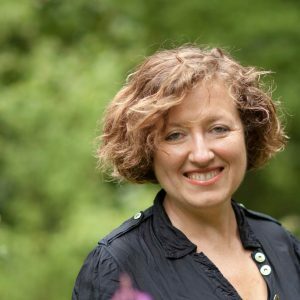 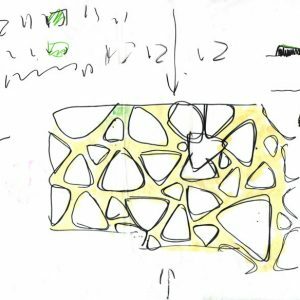 We have no intention to define clear boundary but try to build a dynamic, interactive, flexible framework, in order to make its own constantly adapt to new needs of the city. 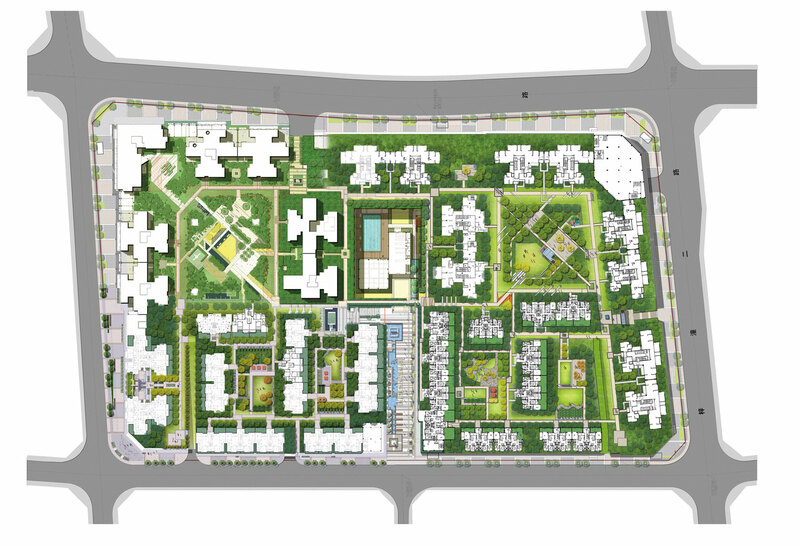 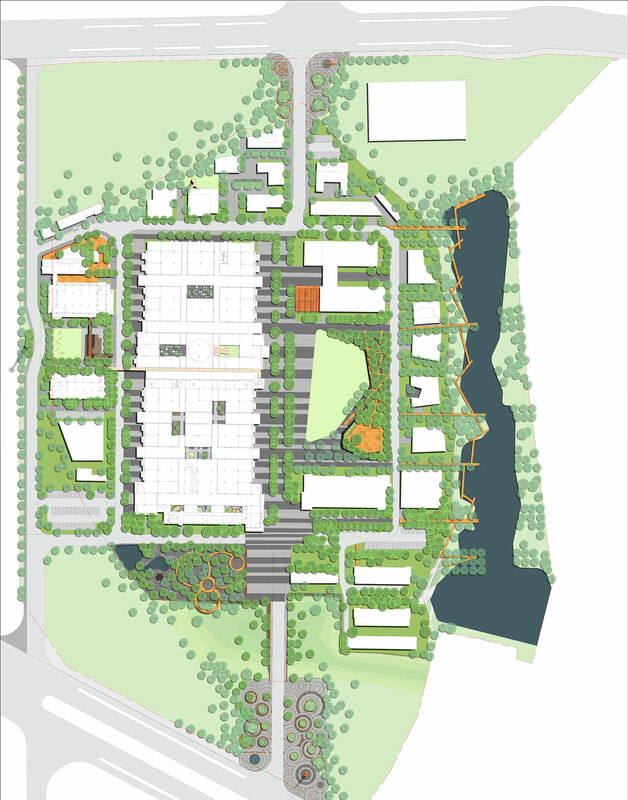 The planning aims at creating a low carbon ecological park with high-efficient linkage, to form “one axis, one ring, four groups and two points”, “one axis” is the north-south central axis; “One ring” is the green landscape ring; “Four zones” are E-business office group, the cultural creativity and information software group, comprehensive service group and the park green space group; the “two points” are the south and the north entrances. 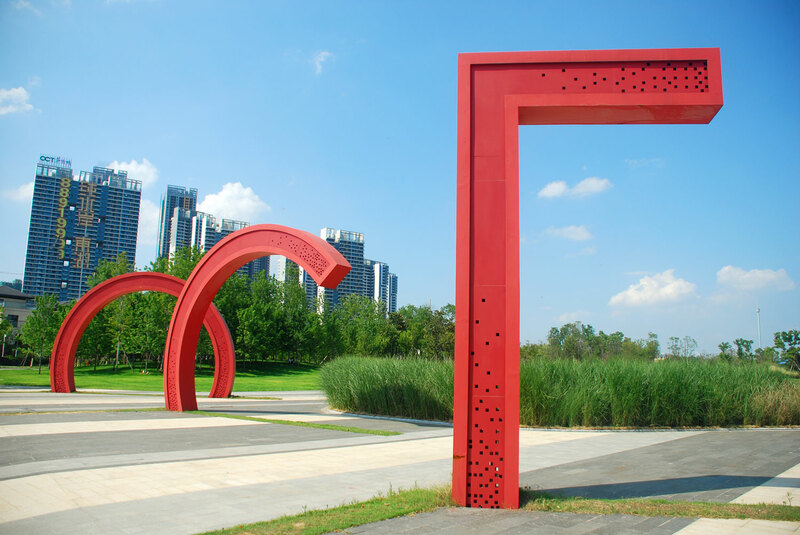 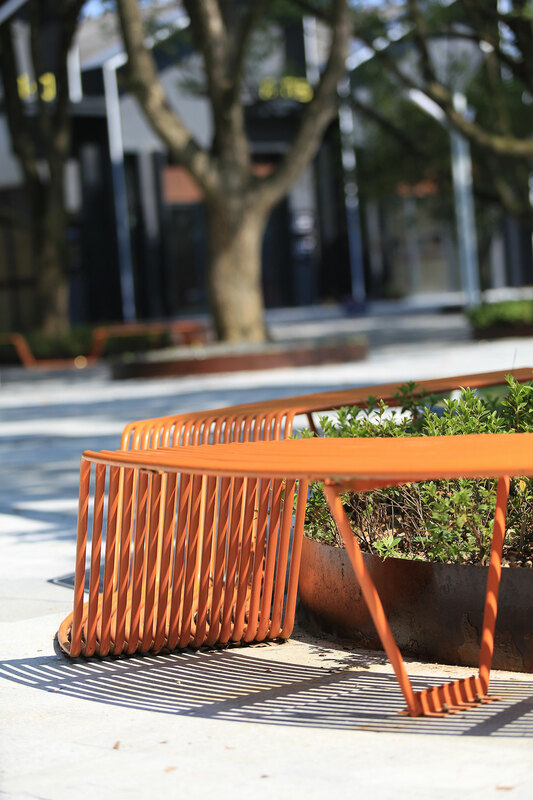 Themed in New Pass & New Future, reproduce cotton culture, add the new feelings of the city and combine history and modern, creating the center of Quzhou Smart City. 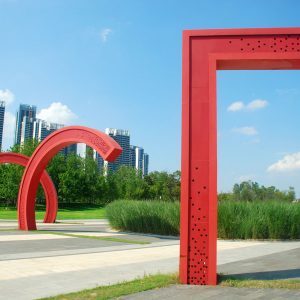 Use internet innovation and cultural creativity R&D as the core, meanwhile, keep the site memory, and create energetic open city park and new e-commerce industrial park. 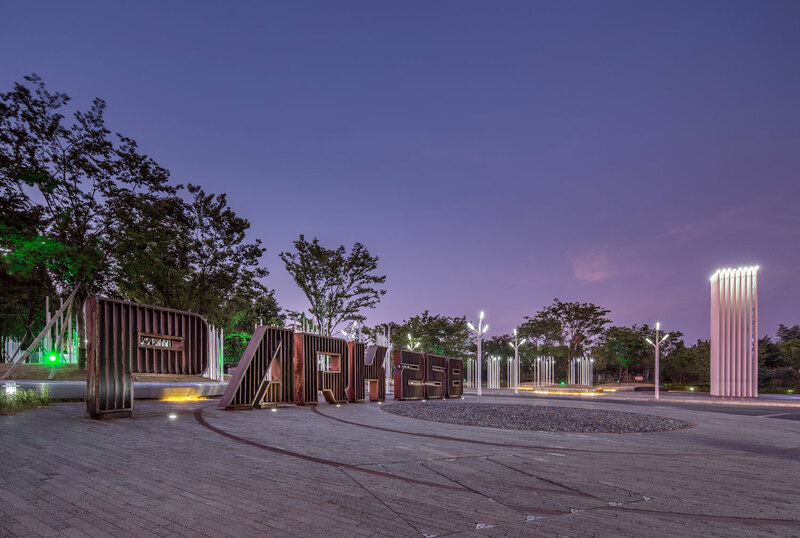 The design fully refines the cotton as the language and the spindles and threads formerly used in the cotton factory are reused as the decoration of the park. 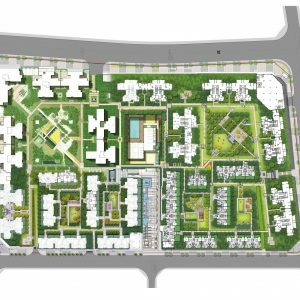 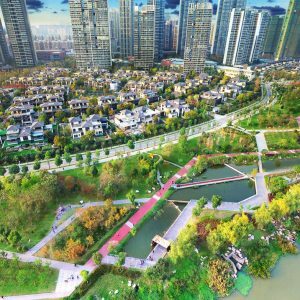 China Ecological Office District is located at Nanhai District, Foshan, Guangdong, covering an area of 300,000 m2 and the construction area of 500,000 m2. 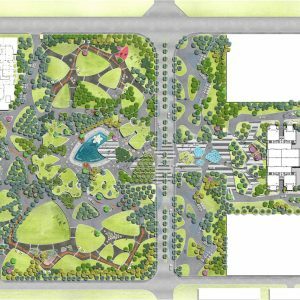 It includes one headquarters business district and eight service buildings: an international conference center, a business hotel, a serviced apartments building, an exchange center, a central park, a shopping street, clubs, etc. 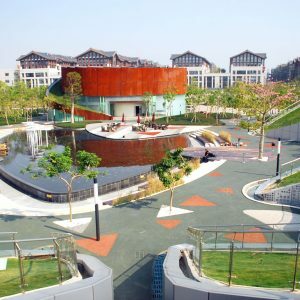 It is the first green business district in Pearl River Delta with the independent property and separated offices. 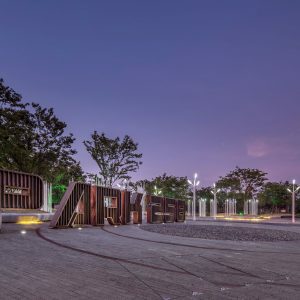 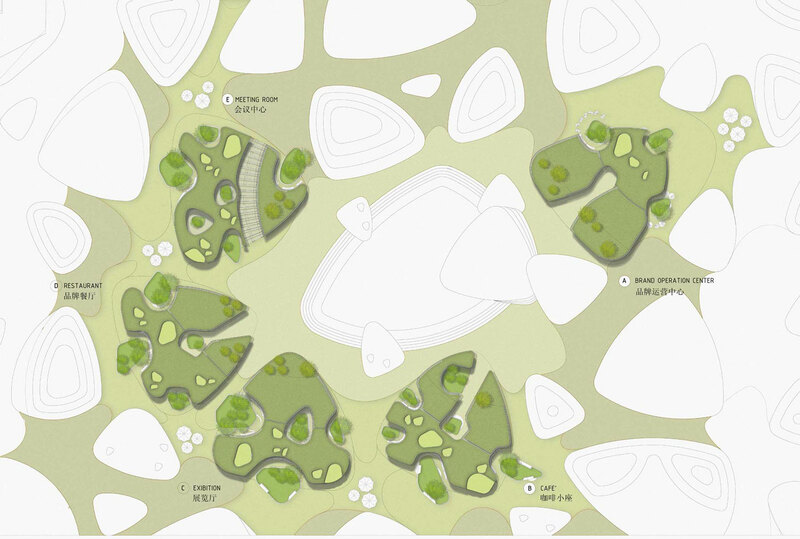 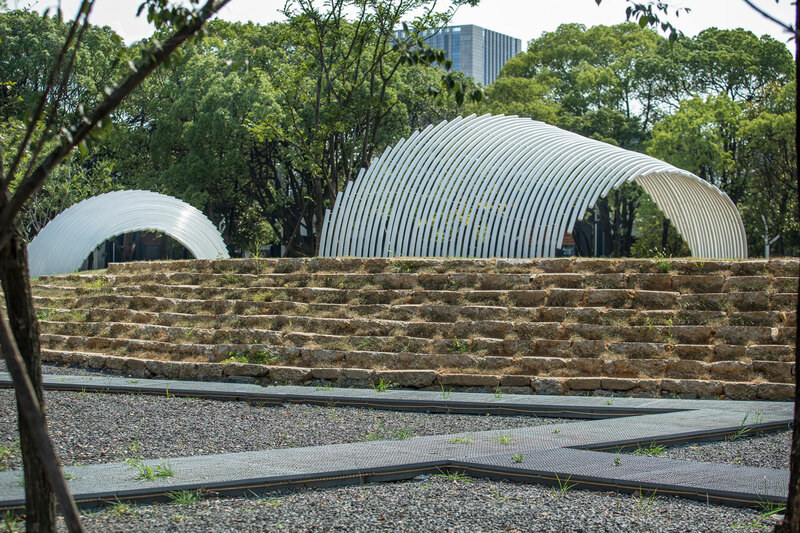 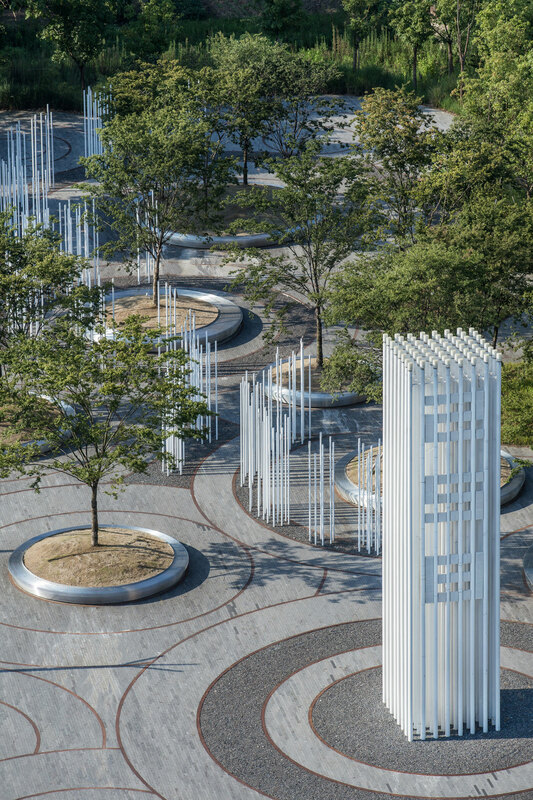 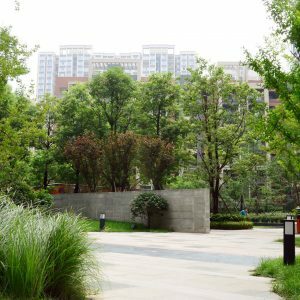 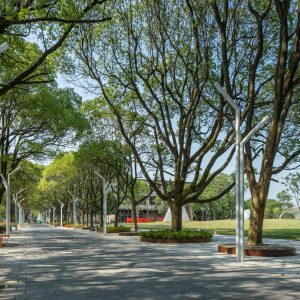 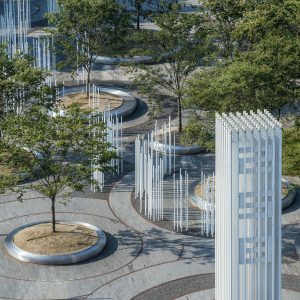 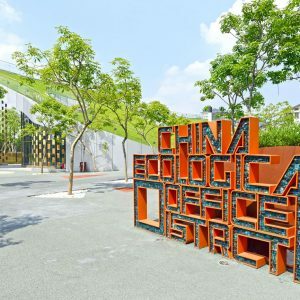 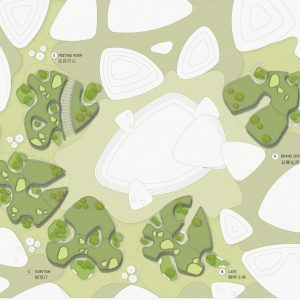 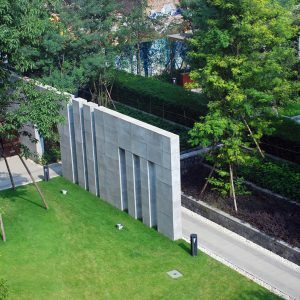 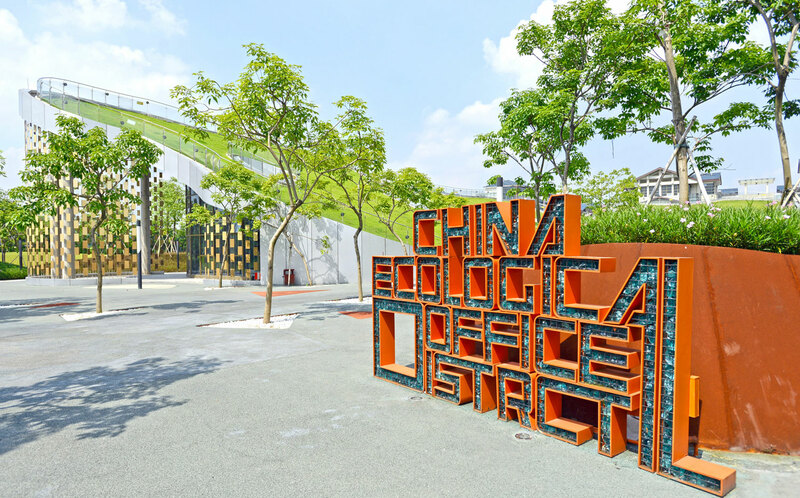 The landscape design area of the Central Park is 51,800 m2 Inspired by the song of the natural forest, extract the essence of the forest leaves, the concept of green leaf cells. 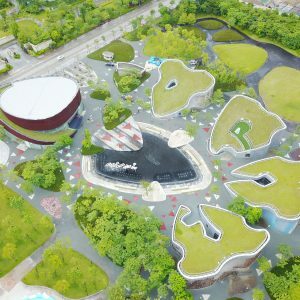 The cell structure is injected into the Landscape and architectural design to build an ecological and recreational business park image. 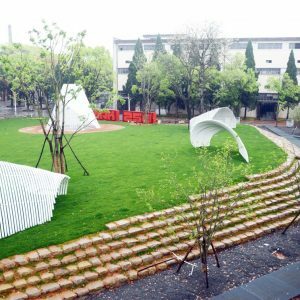 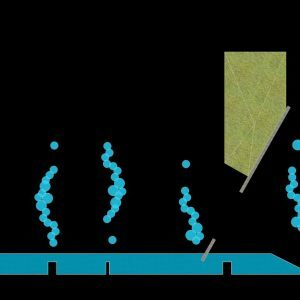 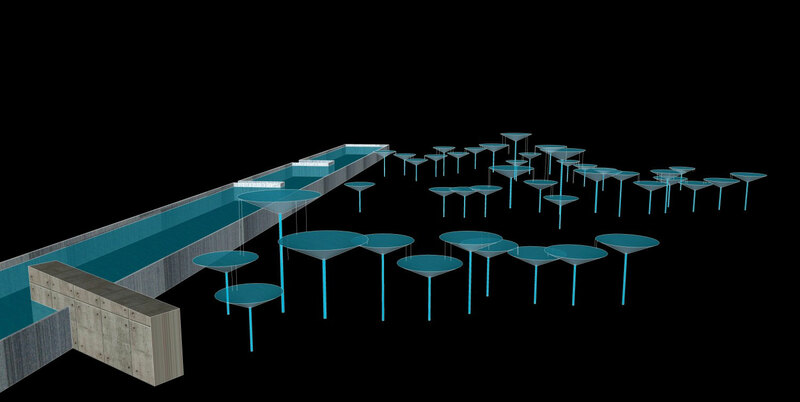 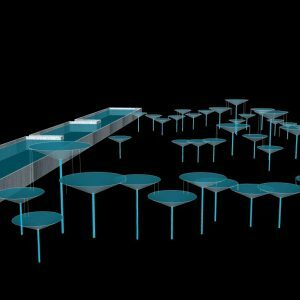 Follow the concept of the green leaf cells, the architectural design evolves the cells into a three-dimensional effect through extruding, pressing and inclining. 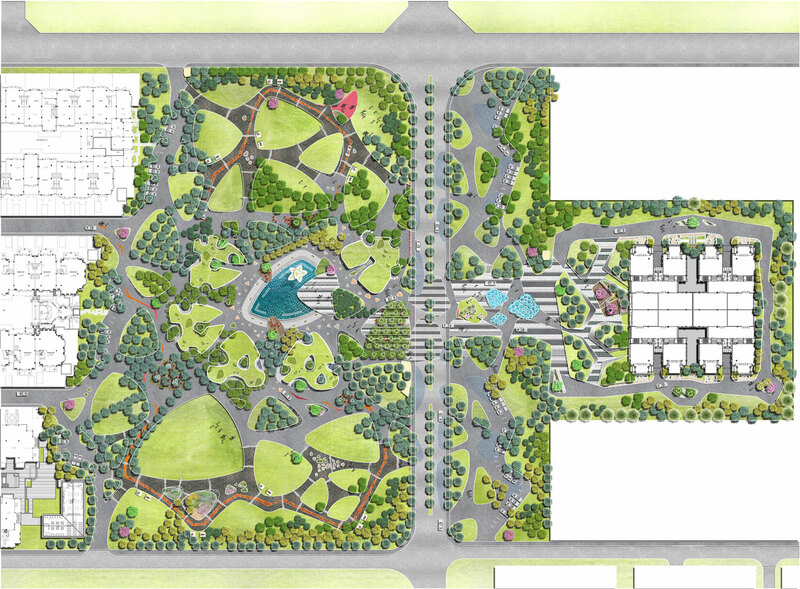 The five cells facing to the central waterscape plaza are set as five different functional areas, organically connecting the central plaza as a whole. 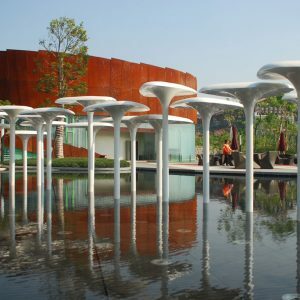 Based on the Theory of the Five Elements in China, the five functional areas are given the different cultural connotation: the conference center represents the “metal”, the coffee shop/tea club represents the “wood”, the dining room represents “water”, the branding operation center represents the “fire”, the exhibition hall represents the “earth”. 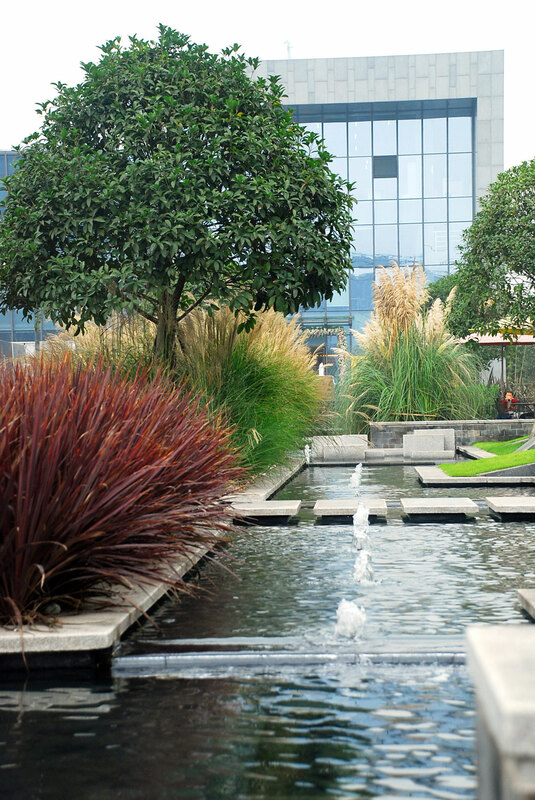 The single buildings with the unique interior space, green roof and yards, surrounding the central plaza, provide a business communication platform of leisure and activity. 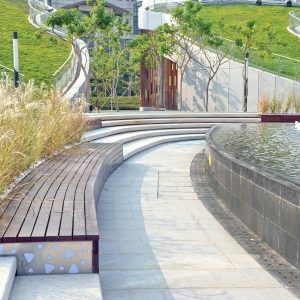 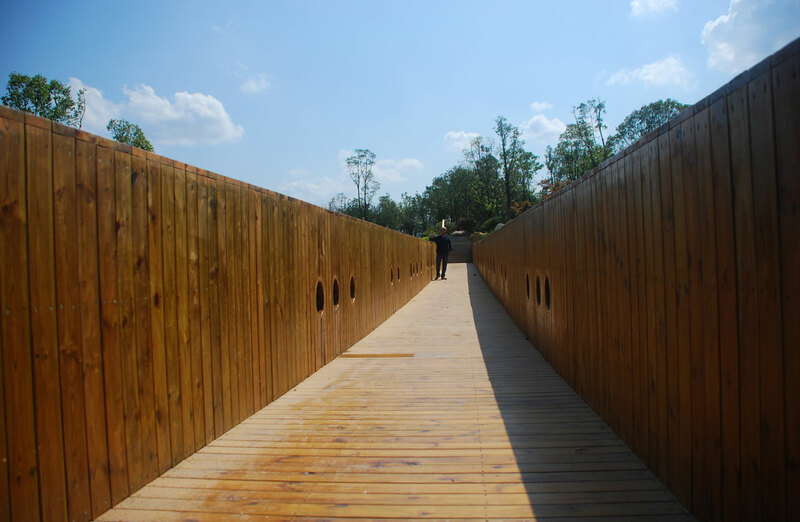 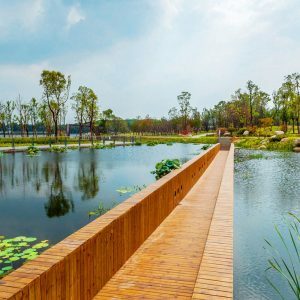 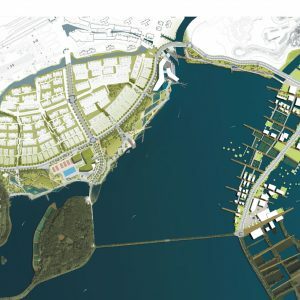 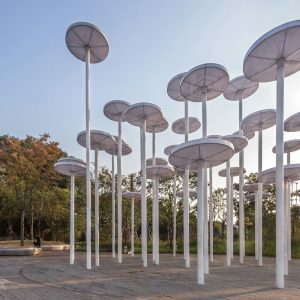 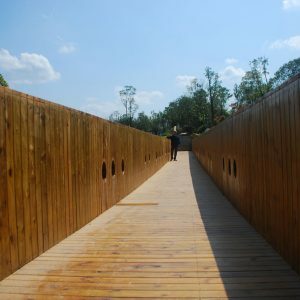 The project covers a 100-150 meter long band along the north side of East Lake, including a 130000 square meters wetland park, 1 km gingko boulevard, and a 10 hectares forest of native metasequoia; the park together with Wuhan Happy Valley, Maya Water Park. 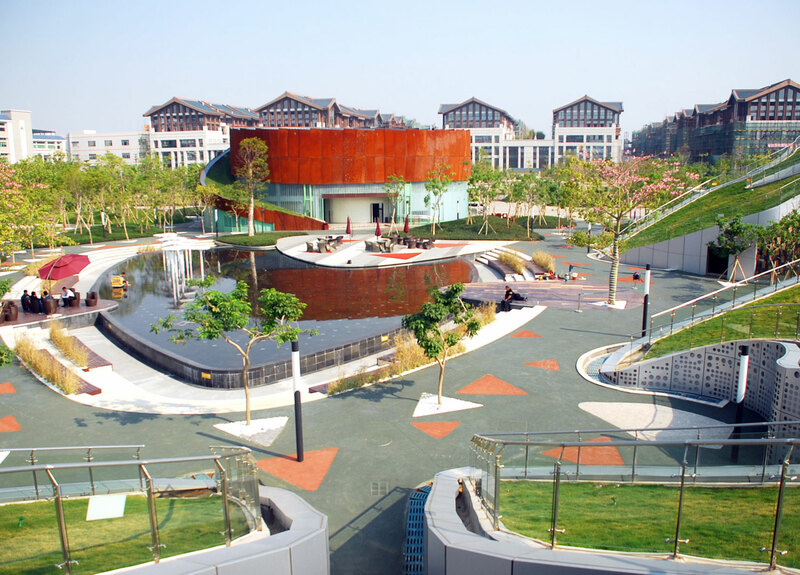 Children’s World is called Four Demonstration Parks of low carbon in Wuhan OCT resorts. 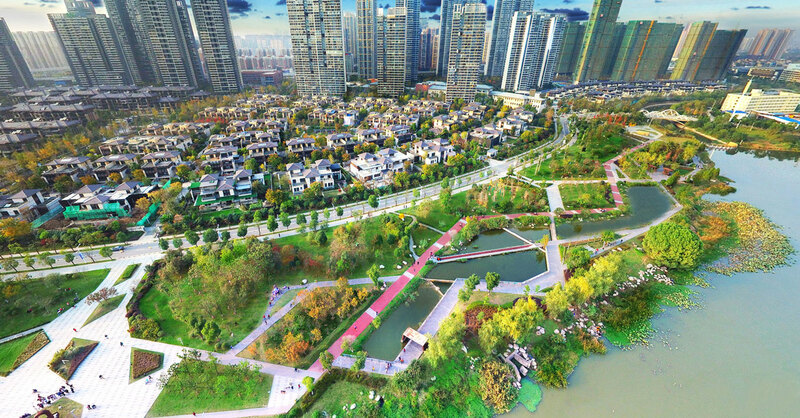 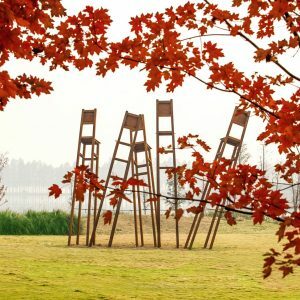 Since ancient times, East Lake has the lives near the lake, let them grow naturally, which bred the civilization, bringing the vigor for the development of reproducing and updating. 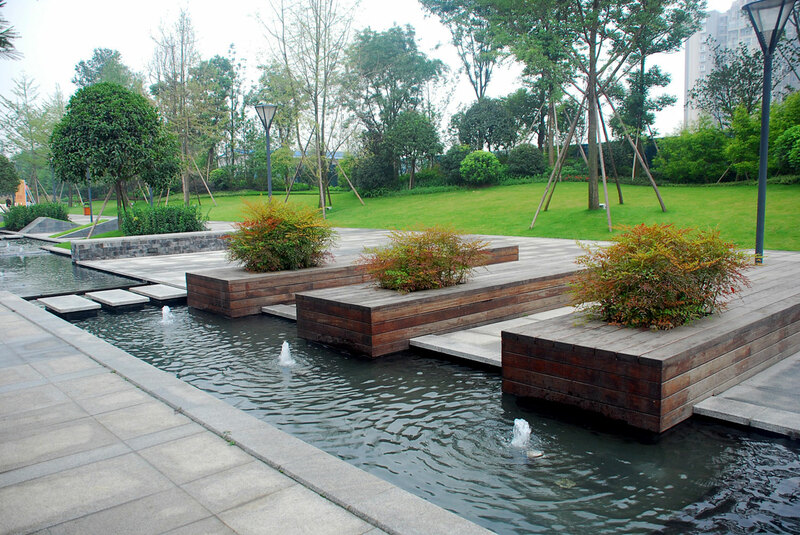 Our inspiration comes from here. 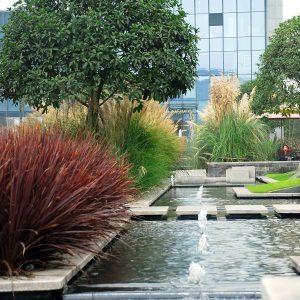 The creative concepts, as nature brings the river transitory ripples, kissing the distant buildings and arousing waves with the dance of life. 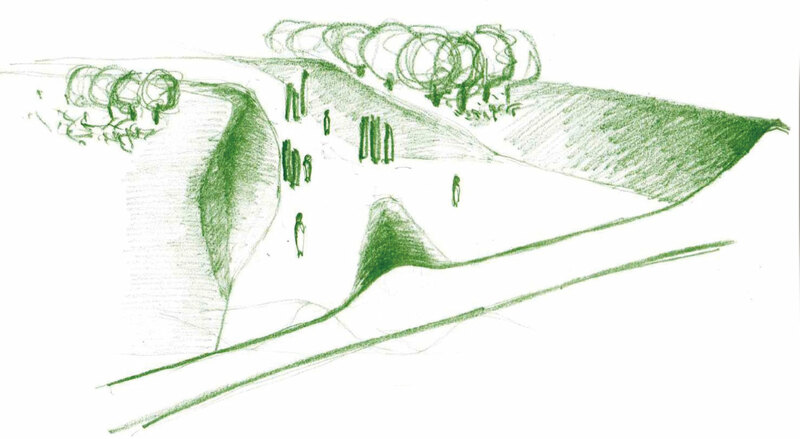 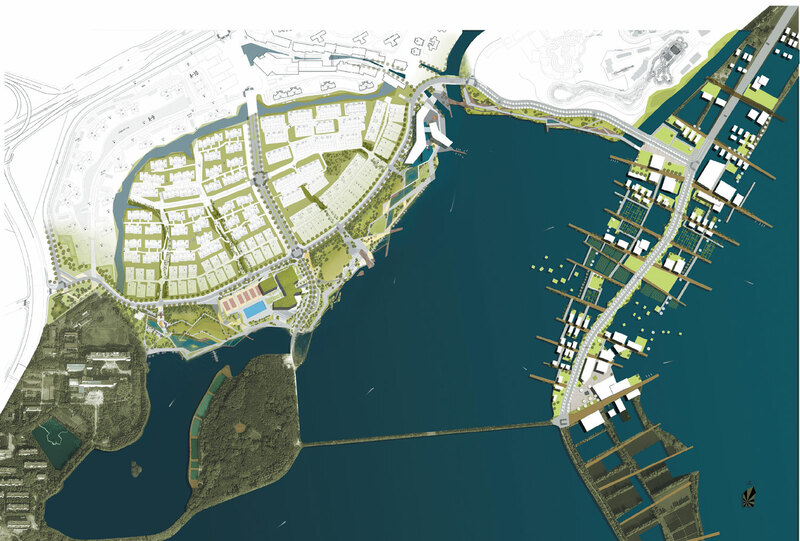 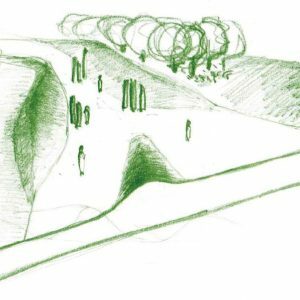 The green space of the main road, as water waves, through the base, connects the whole Greenland landscape space, open regularly and changing as walking, dividing the whole area by the long green space into four sequences. 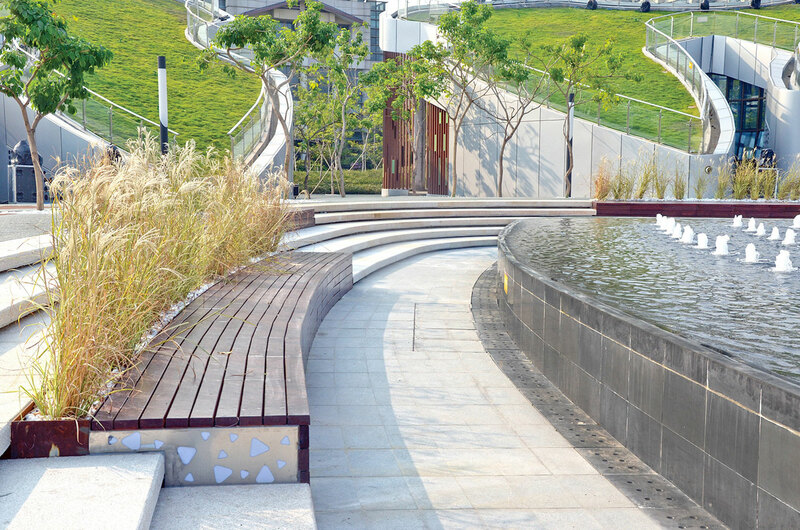 The main landscape was made by the eastern static landscape experience area, the earth art experience area, the sports center building and the dynamic scene, at the same time, combining by jogging, cycling, roller skating to make the slow motion space, creating the rich experience waterfront space. 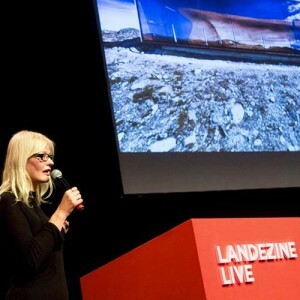 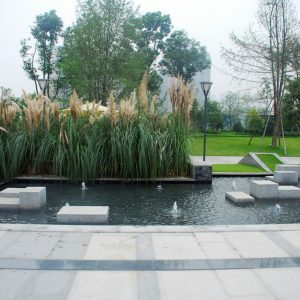 On hard landscape design, we paid much attention to the embodiment of the humanities and the participation of the people, with the sound of the design of the device, stimulating the exchange of the public, the history, the nature, and with the unique experience form, inserting the special characters different from the surrounding. 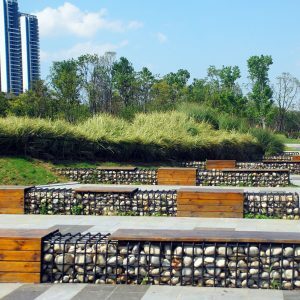 Slow waterfront activity space intervention, provides daily leisure fitness sites for people, improves the efficiency of daily use, and service. 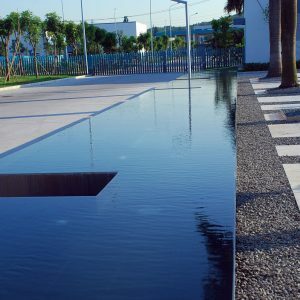 Inspired by the characteristics of the Water Group, architectural design adopts the concept of overflowing: buildings as a container, water flows along the wall of the building to form the texture and feature of the façade. 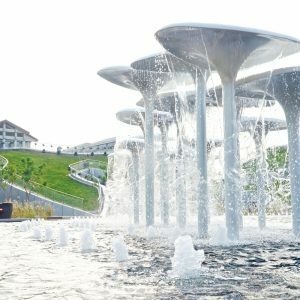 Meanwhile, follow the water group’s logo color, transform the ceilings and create the modern industrial building group. 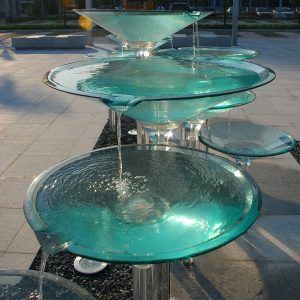 Landscape concept is also themed in “water”. 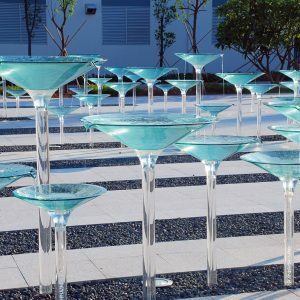 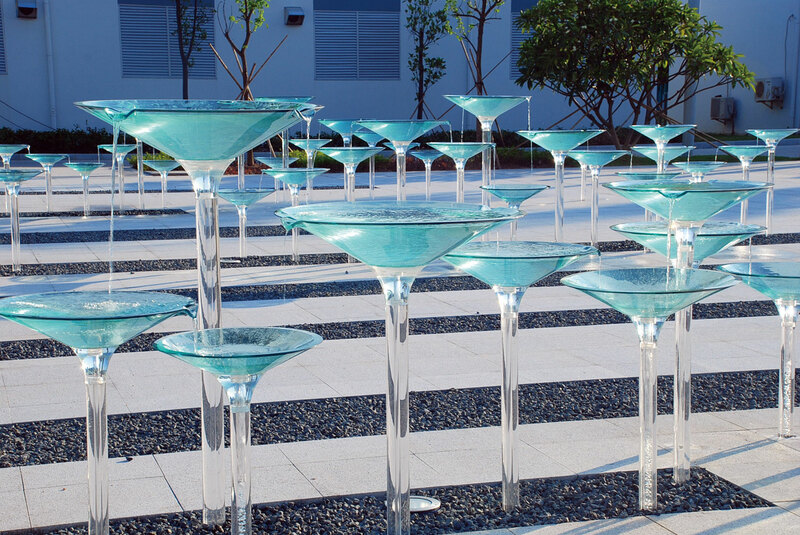 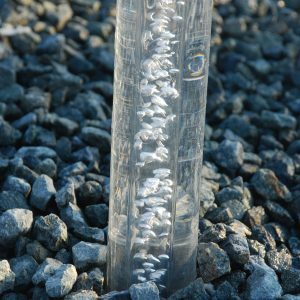 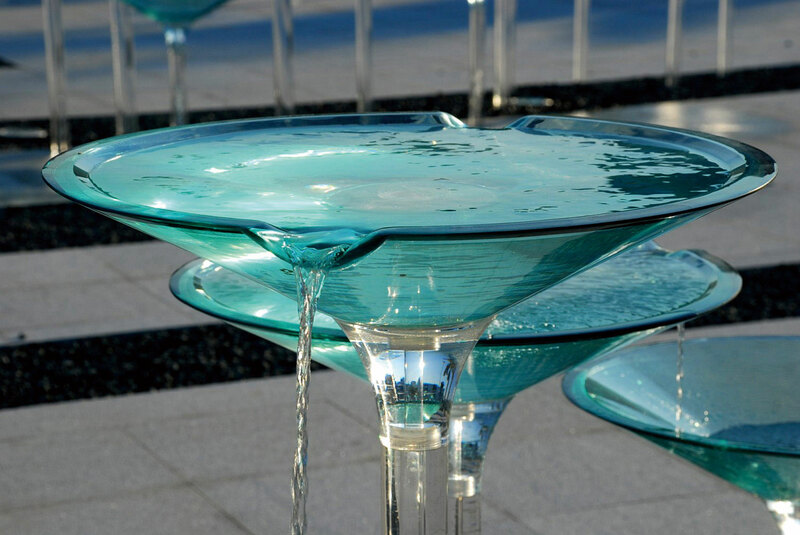 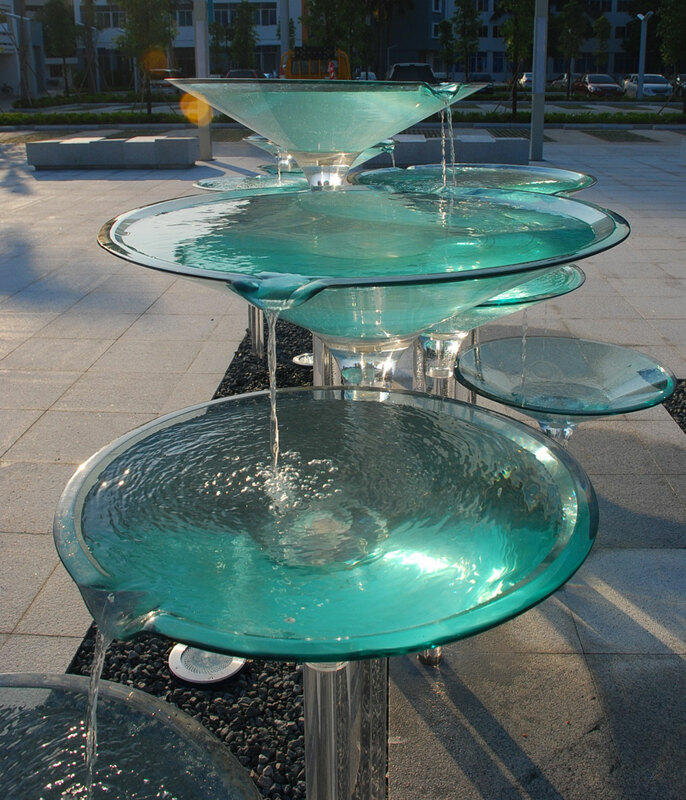 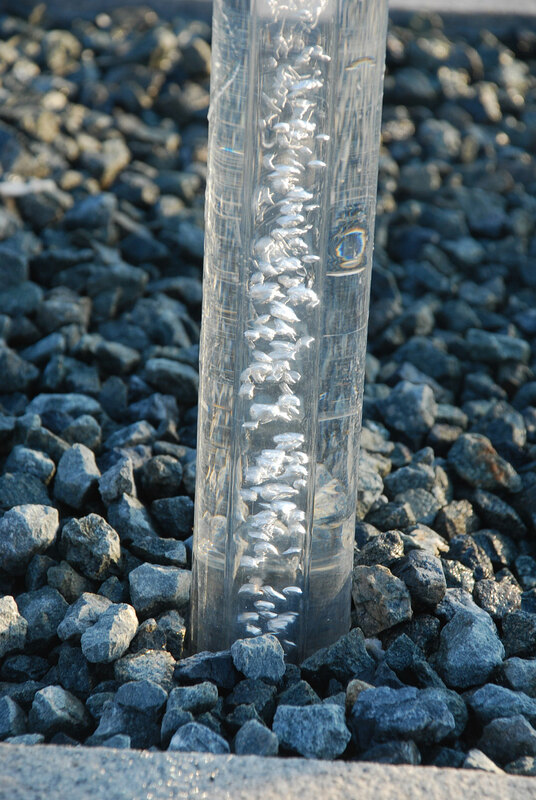 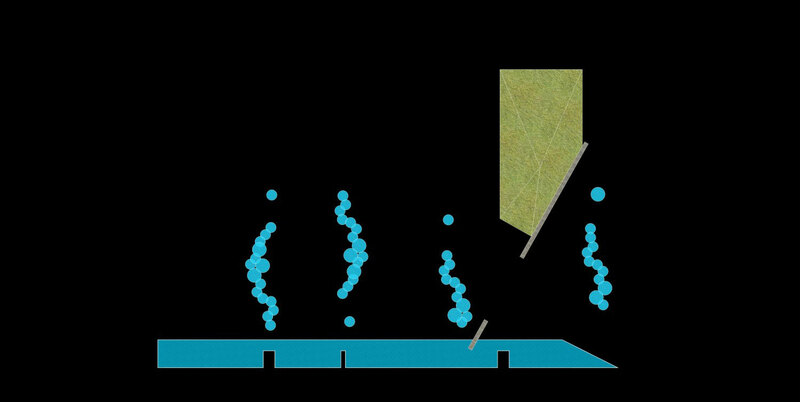 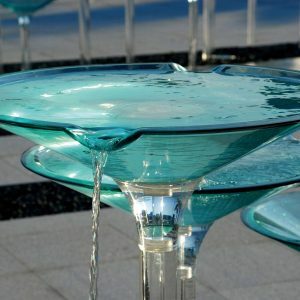 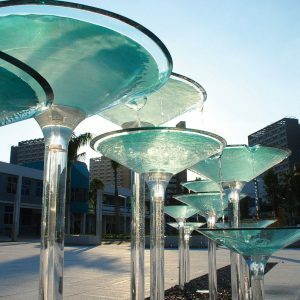 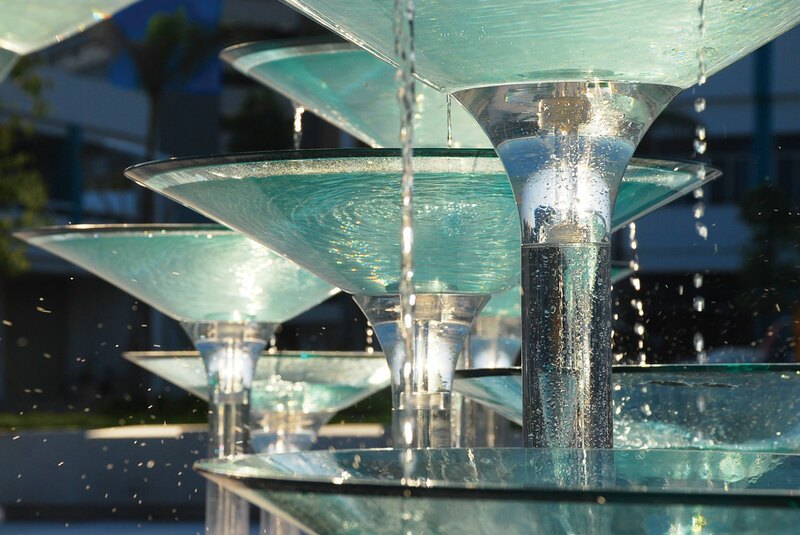 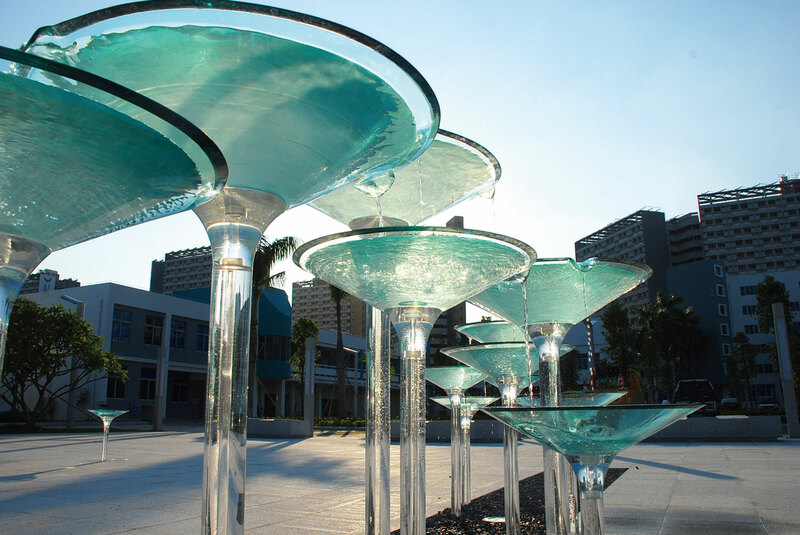 In order to show the nature and principle of water plant to filtrate and purify the water, designers create a unique art Sculpture of “water dominoes”, a concise and modern water landscape, from waterscape to handrails, not only echoing the buildings of the site, but also expressing the characteristics of water. 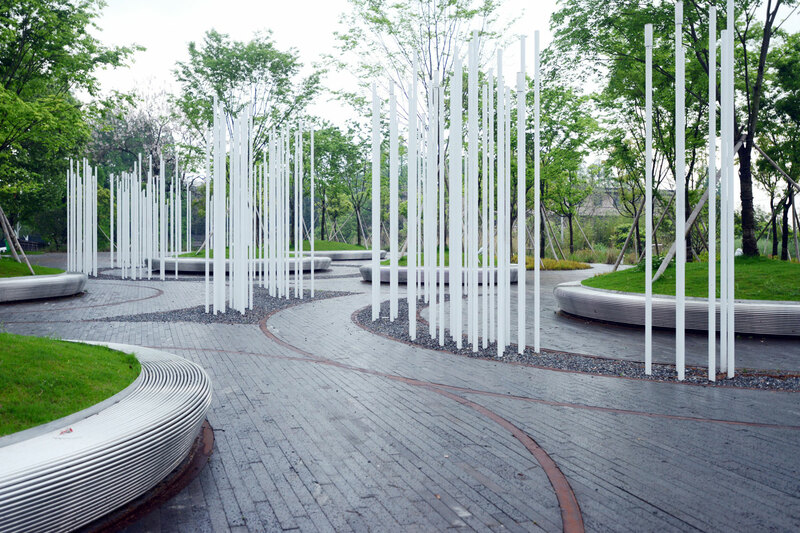 The project, located in the northwest of Chengdu, covered an area of 90,000 square meters. 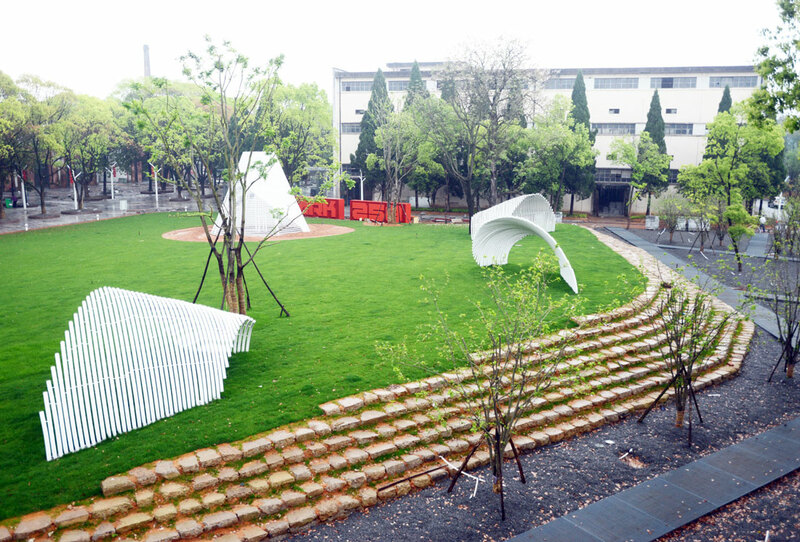 It was adjacent to Southwest Jiaotong University and in the line of Chengguan High-speed Rail. 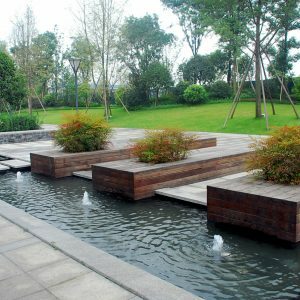 The overall architectural planning was concise and modern style. 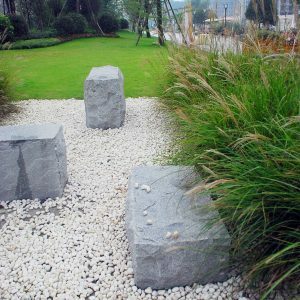 Landscape design idea was from “Art, Sunshine & Sports” and tried to create a simple, romantic, elegant and friendly atmosphere. 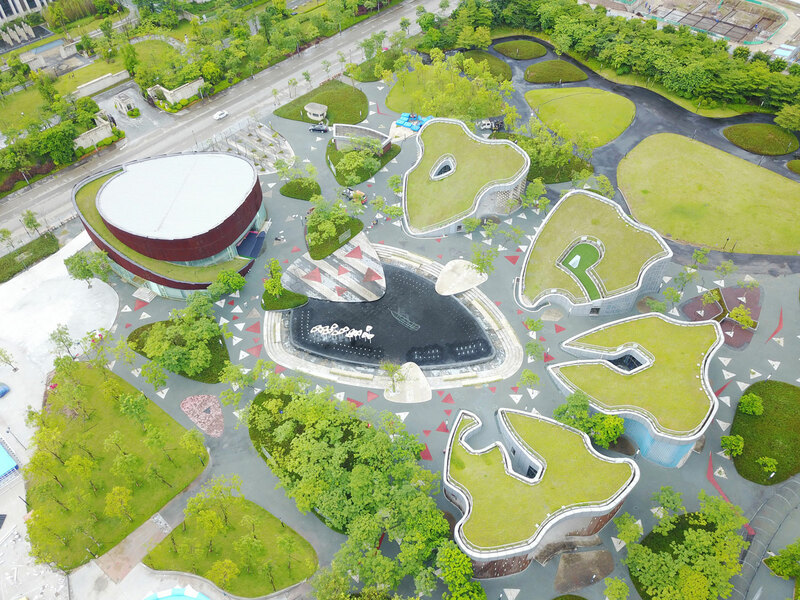 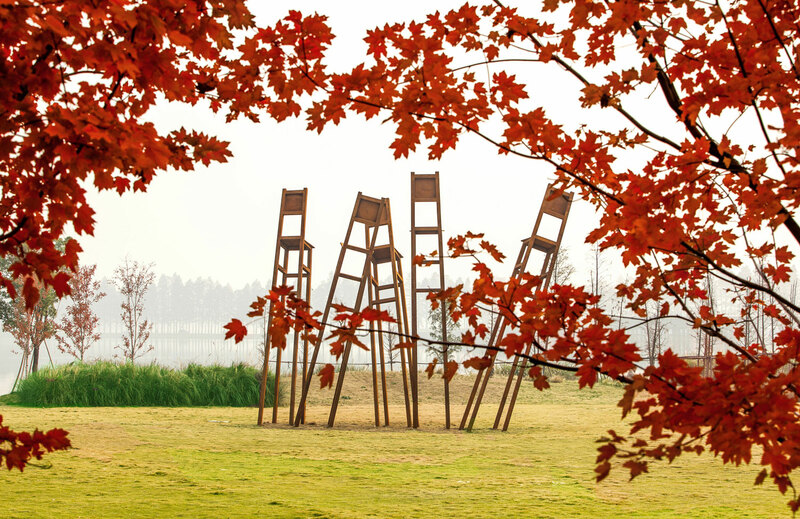 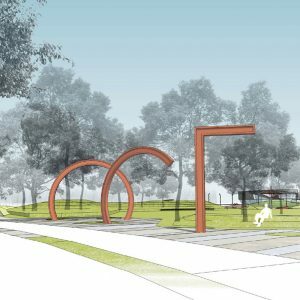 The overall landscape designed a structure of four parks and a shaft axis: the shaft axis means the contemporary art in Italy; the four parks are respectively “Smelling Experience Area”, “Visual Viewing Area”, “Leisure & Recreational Area”, “Meditating Area”. 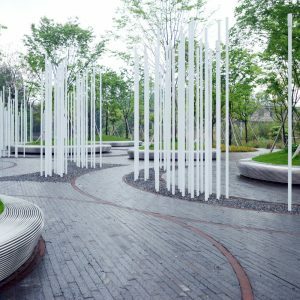 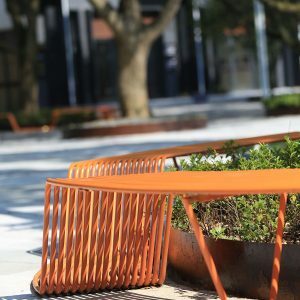 To reflect different theme landscape parks through different landscape techniques, and to make the whole community endow with life vitality, more closely to life. 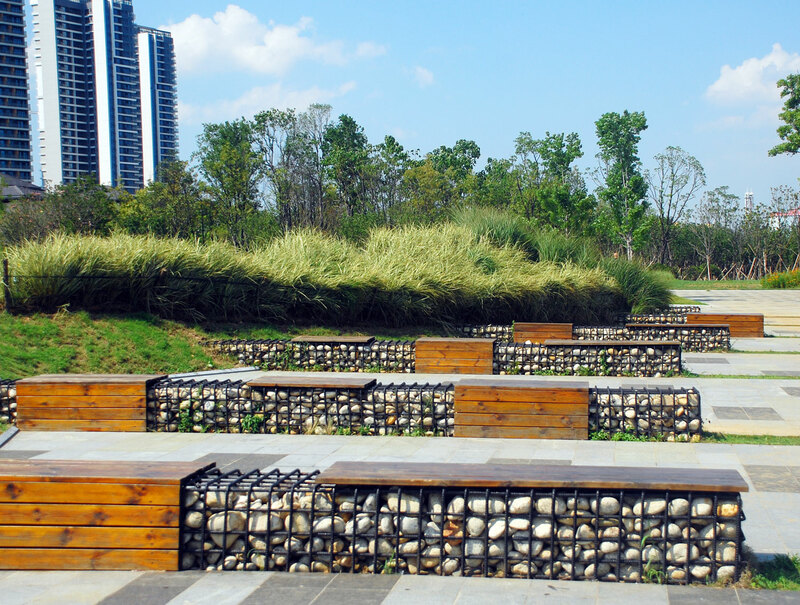 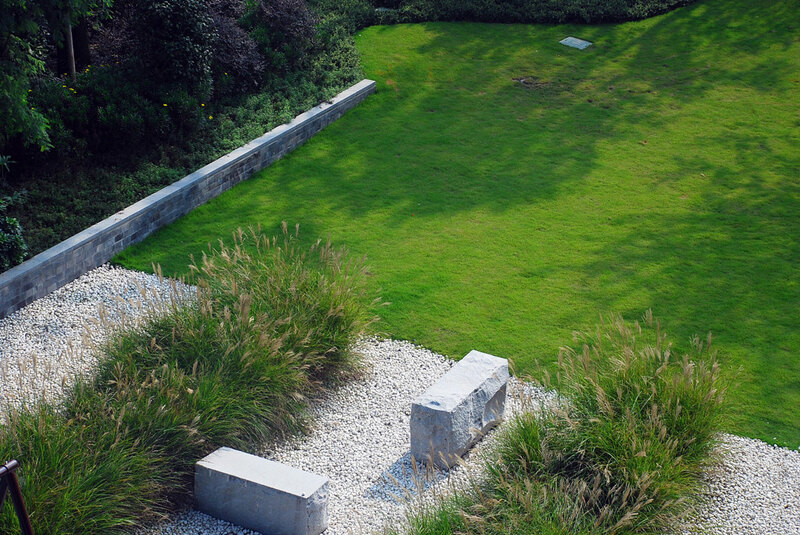 Another feature of this design: to make full use of the local materials and native plants landscape to landscape is not only to control the cost of the landscape, but also to fully show the local culture.